When I was an undergrad at Iowa State University, I took one agronomy class to help prepare myself for farm-wifery. It turned out that I was pathetic at having any logic or understanding regarding agronomy, including about weather (although, one agronomy concept and visual that stuck with me is that soybean plants are dicotyledens). The wonders of nature still get lost on me, including weather-related phenomenas. Thank goodness I have Bill to point them out to me, like he did Friday night. We were out for a walk at about 8:30 PM when the humidity was 78% and the temperature was 75 degrees. Sticky. 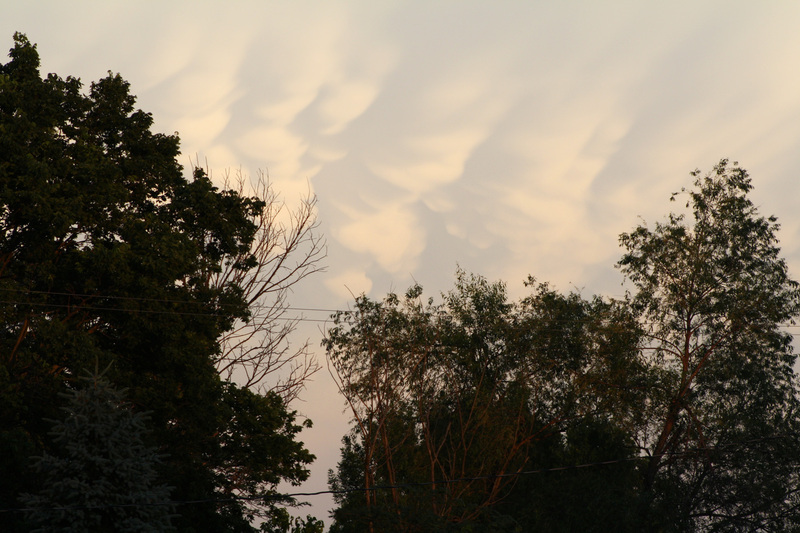 According to my resident expert, the cotton ball-puffy clouds in this photo are mammatus clouds occurring in a large cumulonimbus cloud. (Rats, that a lot of the photo’s cloud detail is lost when viewed on the web.) Cumulonimbus mammatus clouds are typically associated with strong thunderstorms, oftentimes with tornadic activity and very high winds. For that reason, Bill said pilots steer away from this type of cloud. Wow. At the link in the previous paragraph (in case you don’t want to click on it and read the info) it says, “The individual mammatus lobe average diameters of 1–3 km and lengths on average of 0.5 km.” From the ground they seem so teeny tiny. This entry was posted on June 20, 2010 at 11:17 am and is filed under Uncategorized. You can follow any responses to this entry through the RSS 2.0 feed. You can skip to the end and leave a response. Pinging is currently not allowed. Yes. I believe that the class was some sort of contracted course or something like that. And/or a self-paced course? I remember having to study on my own for quizzes on certain modules/chapters and then signing up for time slots to take the different quizzes. I just seemed to not be “getting” the hang of so much that I was supposed to know. One time I cried or nearly cried to Bill because I was doing so poorly in the agronomy class that I didn’t think I’d pass. He encouraged me to stick with it. So I did and I think I got a C.